This three-day/two-night tour begins in Seward and ends in Anchorage. It is the perfect way to visit Denali National Park. With two nights in Denali, you'll have more time to experience all that it has to offer. Package includes deluxe motorcoach travel from Seward to Denali, baggage handling to and from your Denali-area hotel, hotel, hotel accommodations, Music of Denali Dinner Theater at McKinley Chalet Resort, transfer and rail travel back to Anchorage. Be sure to check for specials and offers. 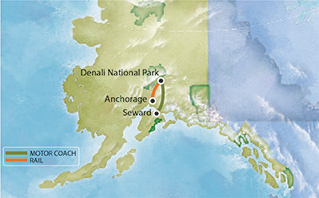 Your adventure begins aboard a deluxe motorcoach as you depart Seward for Denali National Park. Upon arrival, you will be transferred to your Denali-area hotel. Unwind with the locals at Lynx Creek Pizza or take advantage of the long daylight hours with a walk on one of the nature trails. Overnight at Denali-area hotel. The day is yours to explore Denali National Park. Take an optional tour deep into the park in search of Denali's famed wildlife. An array of tour options are available to purchase at the tour desk. Our staff can assist you in planning your day. This evening, enjoy an unforgettable dinner experience at Music of Denali Dinner Theater at McKinley Chalet Resort. Overnight Denali-area hotel. Enjoy a morning at leisure. Then, board luxury rail for a return trip south to the Anchorage rail station. Your tour ends upon arrival in Anchorage. This four-day/three-night tour begins in Seward and ends with an overnight in Anchorage. It is the perfect way to visit Denali National Park. Enjoy dinner and a show at the Music of Denali Dinner Theater at McKinley Chalet Resort featuring family-style dining and a spirited original musical about the first men to reach the summit of Denali. With two nights at a Denali-area hotel, you'll have more time to experience all that it has to offer. Package includes motorcoach travel from Seward to Denali, 2 nights at Denali, Music of Denali Dinner Theater at McKinley Chalet Resort, rail travel from Denali to Anchorage and an overnight in Anchorage. All transfers between airport, hotels and rail depots are included. Be sure to check for specials and offers. Enjoy a morning at leisure before transferring to the rail depot to board luxury rail service this afternoon for a memorable rail trip south. Upon arrival into Anchorage, transfer to the your hotel. Overnight at Anchorage hotel. Relax in your room in Anchorage or if you're not quite ready for the adventure to end, venture an hour from Anchorage to Portage Glacier on an optional glacier cruise! Journey aboard themv Ptarmiganon an unforgettable cruise to the face of Portage Glacier. Transfer to the airport for your trip home.